For too many of Ohio’s college students, their first taste of “the real world” is coming courtesy of the negative impacts caused by ObamaCare. Unfortunately for these young people, the taste will be bitter as they come face-to-face with the reality that ObamaCare is becoming the cause rather than the cure for many of their economic and healthcare woes. ObamaCare was sold to Ohioans as a means to make healthcare more affordable and more accessible. This has not turned out to be the case. This poorly conceived and poorly executed law has had the opposite effect. ObamaCare has been particularly devastating for young people who are being hurt in the short term with reduced hours at work and lost job opportunities all because of ObamaCare. In addition, these young people will be left holding the bag to pay for ObamaCare in the long term. We have heard from college students all over Ohio who are hurting and afraid, as a direct result of ObamaCare, that they will not be able to find employment. They clearly have reasons to be concerned. The National Small Business Association recently released its 2014 Small Business Health Care Survey. The survey reveals that 91% of respondents reported an increase in the costs of their health plans at their most recent renewal. One in four small businesses saw cost increases exceeding 20% at their most recent renewal. When asked specifically about the Affordable Care Act, commonly referred to as ObamaCare, small businesses reported spending on average 13 hours and a monthly cost of $1,274 to understand the law. But perhaps worst of all, one-third of these small businesses say they are purposefully not growing as a result of ObamaCare! In addition, a recent Congressional Budget Office (CBO) report showed that because of ObamaCare more than 2 million full-time jobs will be lost. ObamaCare carries with it 21 new tax increases amounting to $1 trillion in new taxes while still leaving 31 million Americans uninsured. ObamaCare is destroying opportunities for young people. Period. In an effort to ensure that everyone understands the crisis ObamaCare is wreaking on our college campuses, we put together the website – http://obamacarecampuscrisis.com/ – where everyone can get the facts about ObamaCare’s negative impact on young people, directly from them and sign our petition to fight back. 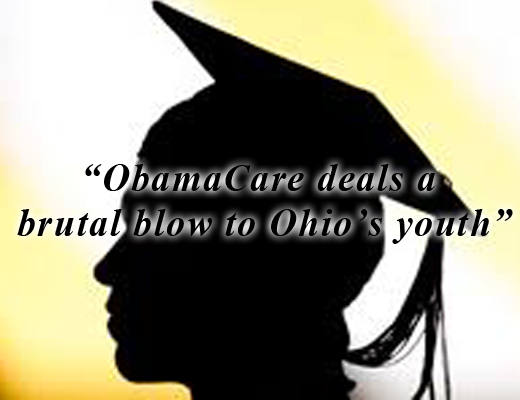 ObamaCare deals a brutal blow to Ohio’s youth. Get the facts and find out what you can do at http://obamacarecampuscrisis.com/. Eli Miller is the State Director of Americans for Prosperity – Ohio and Americans for Prosperity Foundation – Ohio.